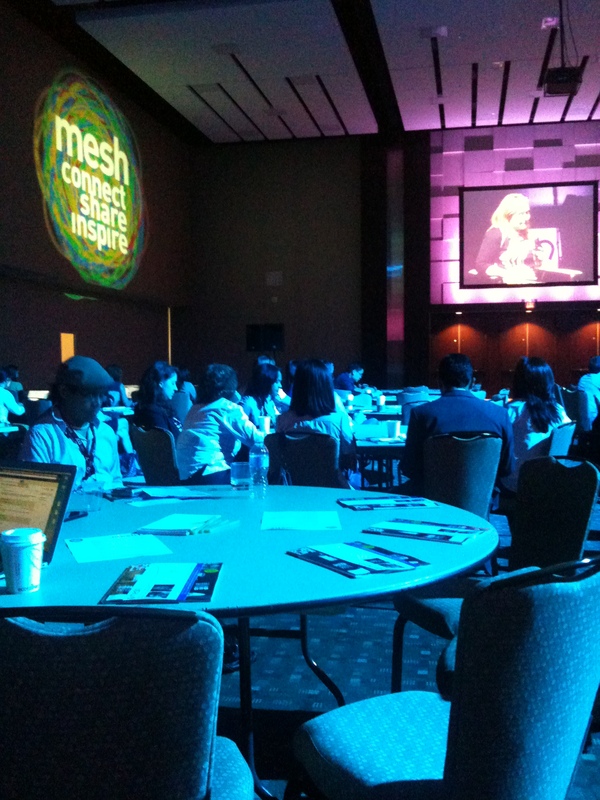 The 2012 edition of MESH, Toronto’s highest-flying Internet conference, looked like it had had its wings clipped. Attendance appeared to be down significantly from last year, and the conference model seemed to have been adjusted to accommodate lower-than-expected turnout. Breakout sessions were offered in just two time slots on the afternoon of the second day; for the majority of the conference, all the attendees (seated, inexplicably, at round tables) watched presentations and “conversations” delivered from a spotlit stage at the front of a cavernous, dark auditorium. Without the usual breaks and movement between sessions, the conference lost some of its energy, which is a shame, because this year’s MESH included some excellent speakers on important topics. For me, there were three big themes that stood out. MESH12 offered a couple of sessions on “big data,” the hot topic du jour in the business press. Former LinkedIn data honcho DJ Patil kicked off the conference with a presentation describing how new ways of harnessing data have the potential to transform business, health care, and individual productivity and well-being. In all of his examples, Patil emphasized that no matter how impressive your data set, the real value comes from knowing what to do with it. LinkedIn’s “people you may know” spotlight is powered by good data and smart algorithms, but it wouldn’t exist if one of their developers hadn’t found a way to use it to drive clickthroughs and deeper user engagement with the site. The killer skill set: combining proficiency in data analysis with deep insights into user behaviour and a strategic outlook. Last fall’s MESH Marketing conference was all abuzz about content marketing thanks to a galvanizing presentation from Marcus Sheridan, and MESH 2012 kept the topic front-and-centre. Even the “big data” talks gave a nod to content marketing, citing cases where companies have been able to use intriguing or titillating insights gleaned from their data as the basis of successful blog posts or media releases. (Max Shron of OK Cupid talked about the publicity and traffic the site generated with a post about how your choice of smartphone correlates to the number of sexual partners you’re likely to have.) HubSpot’s Brian Halligan gave a cogent overview of the state-of-the-art in content marketing (create “remarkable” content; keep producing, don’t just dabble; focus on “relevance and authenticity”) – mostly truisms, but well-phrased and worth repeating. Clay Johnson made an analogy between the obesity epidemic and levels of “junk” media consumption, arguing that we need to put ourselves on an “information diet” to ensure we’re taking in balanced reporting about important issues. Rebecca MacKinnon outlined the ways repressive regimes around the world control their populations’ access to the Internet, while Michael Geist gave an update on the state of Internet freedom in Canada. Matthew Ingram engaged a delightfully contrarian David Winer in a wide-ranging conversation about (among other things) whether Twitter should buy the New York Times and the pernicious trend of website personalization, which prevents us from knowing what we don’t know. The conference wrapped up with Andy Carvin‘s stories about using information gathered on social media sites to report on the Arab Spring movement. Verifying crowd-sourced information and engaging in “real-time network analysis” to identify sources and their credibility: a new form of journalism – and techniques that maybe everyone needs to learn. I’m one of the organizers of mesh, and wanted to thank you for the feedback about the format and content. While we would have liked more people to attend, it wasn’t down too much from mesh ’11. We experimented with a new format after using the same approach for six years. We’re reviewing whether it worked, so I appreciate your thoughts. In an ideal world, mesh would be a “rinse and repeat” event but the market and Web evolves so quickly that you need to keep tweaking the dials – sometimes things work, something they don’t. At the end of the day, the most important thing for us is the content, which I think was as strong as ever. Thanks for listening, Mark. The content was, if anything, stronger than ever, and I look forward to seeing where you take MESH in the future.